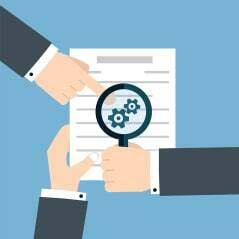 The annual audit is an opportunity to glean a valuable insight into your business without bias. Auditors report to the company’s shareholders (or members) on whether the annual accounts show a ‘true and fair view’ of the company’s financial activity and position. An audit comprises of an inspection of the business accounts, including the accounting systems, invoices and other documentation. The auditor will discuss their findings with the appropriate senior management, adding value during this process having gained a reasonable understanding of how the business operates. As a business grows, shareholders are more likely to take a strategic role within their business and have less involvement in its day to day operations. Without close scrutiny of the management information and internal systems the quality of information may reduce over time. In addition to reviewing the accuracy of a company’s financials an audit looks in detail at internal systems to ascertain system weaknesses and non-compliance with internal procedures. An independent audit carried out by a reputable firm of auditors provides a stamp of quality for shareholders. An audit will enhance the credibility and reliability of the figures being submitted to prospective purchasers, greatly speeding up any due diligence process that will take place once the business is ready to be sold. Adding a layer of assurance early on will mean less work and debate about the value of your business further down the line and provide a buyer with confidence in the quality your financial statements. An audit adds credibility which helps with credit ratings and making your company more attractive to suppliers and investors who rely, in part, on credit rating agencies’ assessment of the company. Private Equity and angel investors in particular favour audited accounts when looking to invest. In some scenarios, an audit may help to identify fraudulent activity. At the very minimum, an audit can uncover weaknesses in the financial systems or sometimes the staff undertaking them, and lead to recommendations for further training or improvement. An audit allows your auditor to get under the skin of your business to understand its operations. The work of the auditor can identify where systems or management can be improved, or where investment opportunities exist. Don’t forget that an auditor who has experience of similar clients (whether this is by size or sector of operation), is likely to be able to spot opportunities as well as risks. Grant audits are a highly specialist area within the audit profession. Many grants, such as FP7, Horizon 2020, INTERREG, Innovate UK and US Federal Funding need to be certified and reported to funders by an independent Registered Auditor. Ultimately, an audit provides assurance. It is an opportunity for the Directors of the company to be fully aware of the risks and opportunities that exist within the organisation and the wider marketplace. Note – there are separate rules for listed companies, non-profit organisations and organisations such as solicitors and banks who hold money on behalf of their clients.